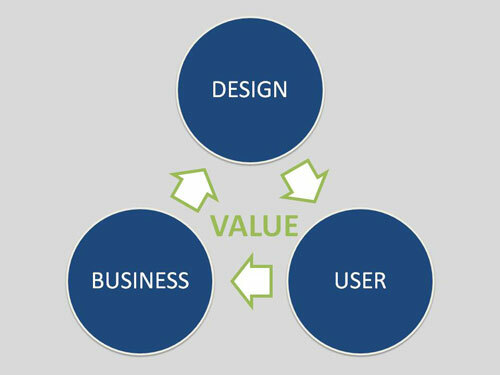 Design Strategy is fundamentally about creating and delivering value to both businesses and consumers. The world is changing rapidly and so is business. Organizations that can not adapt to the increasing pace of change will struggle to remain competitive. Most diagrams of this type place "learn" between "act" and "observe." I've deliberately omitted it because I believe learning should take place during every stage of the process. 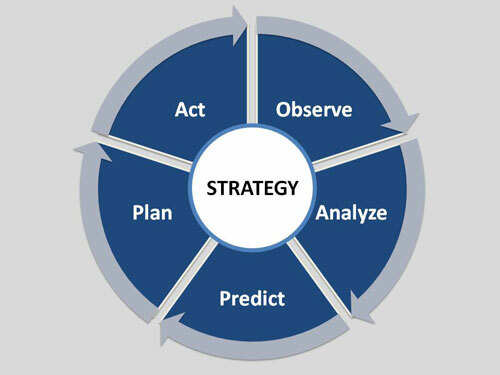 Strategy is about looking at the information you have now (observe), understanding the potential interactions (analyze), and extrapolating the possible outcomes (predict), developing tactics to meet the desired outcome (plan) and then executing the plan (act). Strategy is a map, not an instruction manual. A good strategic plan is vague enough to allow improvisation but specific enough that the people responsible for executing understand "what" and "why." Of course it is famously noted that planning goes out the window the second the plan is implemented; because the predictions you made are likely inaccurate. This is exactly why a strategic plan must be flexible and clear. When a problem arises, people need to have enough information to decided whether to press forward or fall back and regroup. Business focuses a lot on efficiency and efficiency is critical, but anyone can be more efficient. It's easy to replicate. What makes one strategy better than another is its ability to adapt to outside forces. However, the strategy must originate in a systems context that actually makes it possible to even see the outside forces. When I think about strategy I think about evolution. Evolution is all about adapting to outside forces. Failure to adapt (often) leads to extinction. Evolution is not deliberate so it is not a strategy per se, but there are important lessons to be learned; the role of adaptation in survival and the complex network of events that create change. At the end of the day, a good strategy needs to control complexity in a way that is sufficiently flexible to overcome the unexpected. Strategy is about implementing and implementing is about managing. You can read all about it, but unless you have actually implemented a strategy then you don't really know what it takes. This is true for any theory based practice. Lack of implementation knowledge is a traditional criticism of design consulting. It is a generalization, but Guy Kawasaki makes an interesting point in the link above, "The issue with consulting is that if you go straight to work for a consultant, you develop this perspective that the hard part is the analysis and the decision. In reality, that’s not the hard part. The hard part is implementing the decision, not making it." I haven't managed a team in a business context but I've managed teams in the real world implementation of complex mechanical systems. I think the lessons are the same. One, implementation is tremendously detail oriented and complex; much more so than you would ever expect when you are looking at the plan. Two, it never goes well, and if it is going well that's a sure sign of impending disaster. Three, you need to give people the right tools to do the job, and then let them do it, and support when necessary. My primary depth in "making" is mixed metal fabrication: machining, welding, sheet metal. It resonates with my personality. It's a difficult medium. In management, the medium is often the people you are working with. A funny thing about metal working is you cannot tell it what to do, you have to ask, coax, and be patient. I think a lot of people run into management troubles with humans, because unlike metal, you actually CAN tell them what to do. The output/implementation quickly becomes an amplification of the managers weaknesses instead of the team's overall abilities. You have to steer, not drive. It's simple really, do the right thing for the right reasons, communicate clearly, and people will follow. Well, it's not that simple at all, but you have to start somewhere. Most times strategy fails because the people responsible for executing it don't believe in it or don't understand it. Design's strength, the most powerful one it can lend to business, is the ability to make order out of apparent chaos. In simple terms, strategy is about creating a plan to get from "here" to "there." Design strategists accomplish this by using prototyping, systems thinking, a user centered perspective, and a set of proven process tools that don't require you to know where you are going in order to get there. Okay, design is a good tool for managing ambiguity and turning chaos into opportunity. Why is this important for business? Because today, the bunsiness climate changes ever more rapidly. Chaos is the norm and traditional business methodologies struggle to manage and adapt to change. Design does this in its sleep. Beyond that, I believe that business needs to be sustainable. The practice of commerce should strengthen the long term future of the individual, the economy, and the environment. Sustainability is about the efficient use of resources and the reduction of waste.